Sarah Rabinowitz Mognoni doing her chores at Labrador Hill Sanctuary, the 15-acre facility for unwanted horses she founded in 2000. Last week, she was charged with animal cruelty, but is protesting her innocence. 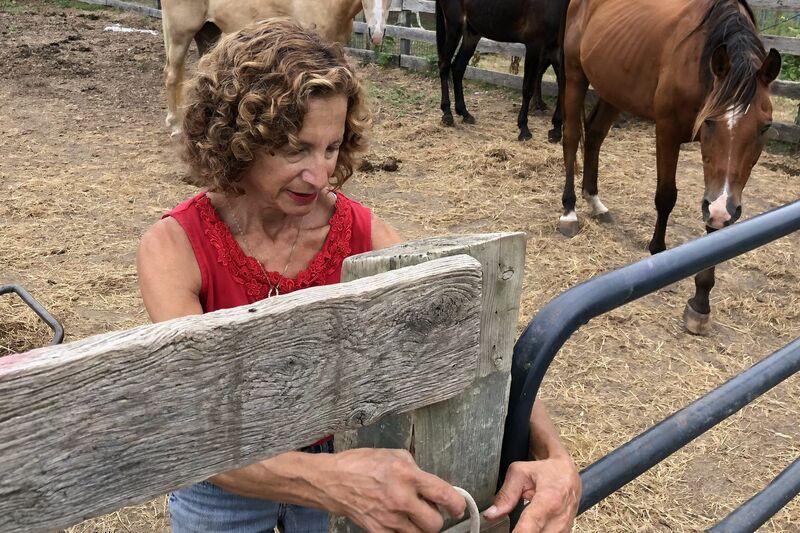 Horse rescuer Sarah Rabinowitz Mognoni, charged last week with multiple counts of animal cruelty, insists she's innocent and says the health of her herd is just fine. "We keep the horses throughout their lives, and we don't discard them or euthanize them just because they don't look good," she said. "People aren't used to seeing a lot of senior animals. They don't look as good as a 10-year-old." Ellen Strack, who filed the complaint that sparked the ongoing investigation by the Camden County Prosecutor's Office, says she has seen a number of equines in Mognoni's care that appeared underfed, diseased, injured, or possibly candidates for euthanasia. She visited Labrador Hill for about two hours July 9 and discovered "horrific … just horrific" conditions there, including a horse with "a gaping wound infested with maggots." Supporters of Mognoni's Labrador Hill Sanctuary in Waterford Township and those who back Strack's facility, South Jersey Horse Rescue in Egg Harbor City, are squaring off on social media and elsewhere. Horse folks, like many animal advocates, tend to be dedicated, impassioned — and sometimes quick to anger. Feuds or turf wars between rival organizations, and schisms within these tight-knit, single-issue communities of activists and volunteers, are not unusual. But the health of the Labrador Hill horses is more important than the emotions or the egos of the humans involved. It's more important than two South Jersey rescue organizations 19 miles apart, or their founders, both of whom are 62 and have what I believe are the best of intentions. Nevertheless, as soon as possible, a veterinarian or veterinarians unaffiliated with either organization ought to examine and evaluate the entire Labrador Hill herd to assess its overall well-being, as well as the health of the individual animals. To that end, Strack kicked off a grassroots campaign Monday. Beyond any immediate needs of this particular herd, an enhanced licensing and monitoring system for horse rescue programs, operations, and facilities should be put in place statewide. At Labrador Hill, portions of fences, sheds, and other facilities were found to be in poor repair, with exposed nails and other potential hazards, and one stall was described as half filled with manure when county and local police and other personnel searched the 15-acre site on Friday. Evidence of dehydration was detected in 28 of 29 horses examined by two state livestock inspectors, and a pony with what looked like a severe leg wound, as well as two horses with apparent eye injuries, also were observed. Mognoni is scheduled to appear in Superior Court in Camden on July 24. But why should it take filing a criminal complaint to trigger this sort of inspection? The question takes on more urgency given the phasing out of the longtime, albeit problem-plagued, enforcement role of the New Jersey SPCA. A bill Gov. Chris Christie signed just before he left office in January is transferring responsibility for the state's animal cruelty laws to local police and county prosecutors. Law enforcement is certainly an important element here. But shouldn't the state, rather than local jurisdictions that may lack the necessary expertise, be keeping a closer administrative eye on rescue facilities and programs? After all, these special places are supposed to provide shelter, sustenance, and care for older, unwanted, or abused horses. They often rely on the good work of volunteers, the good faith of donors, and the good will of the surrounding communities to accomplish their important mission. I paid my own visit to to Labrador Hill on Sunday, and saw perhaps half of the 70 to 75 horses, donkeys, and ponies in the herd. I also visited when I wrote a column about Mognoni and her program in 2016, and on neither occasion did I notice animals that seemed injured or in obvious distress — let alone dying, as some Labrador Hill critics have alleged. But I'm not a certified livestock inspector, much less a veterinarian. Robert Bende, the longtime veterinarian for Labrador Hill, did not respond Monday to a message I left with an employee at his Tabernacle, Burlington County, office. Mognoni founded Labrador Hill in 2000. Strack established her organization a decade ago. Both are longtime horse lovers. "Sarah is a very personable lady," Strack said. "I told her, 'Let us help you. Let me get a team of my veterinarians in here.' But she told me her herd was living a natural life, the way they are supposed to. "I had to raise a ruckus, because nobody was doing anything." Mognoni declined to discuss the details of the criminal case, but did say she has made a number of improvements to the physical plant in recent months. She also said there has long been a "witch hunt" against Labrador Hill. "Some members of the horse community have been taking venomous shots at us, reasons unknown," Mognoni said. Her daughter, Lizzie, 22, who essentially grew up at Labrador Hill, likened hostility directed at the facility and, particularly, at her mother as "high school bullying times 100." She also deemed it inexplicable. "Basically at this point we are running a hospice," Mognoni said. "A horse hospice for animals nobody wants." All the more reason to make sure the Labrador Hill Sanctuary provides the best possible facilities and care. The magnificent and vulnerable animals it serves deserve no less.